JEFFERSON — The most important thing in the fight to preserve the Second Amendment is to pass on the rights and values to the next generation, David A. Keene told Fort Atkinson Wisconservation Club members Monday evening. Keene, a Fort Atkinson native and former president and current board member of the National Rifle Association (NRA), emphasized the importance of ongoing efforts by local groups such as the Wisconservation Club to preserve Americans’ right to bear arms. He was the keynote speaker during the Wisconservation Club’s 67th annual banquet at the Jefferson County Fair Park Activity Center in Jefferson. A 1963 graduate of Fort Atkinson High School, Keene is the son of the late Mr. and Mrs. Arthur W. Keene Jr. and brother of the late Fort Atkinson police Lt. Roger Keene. 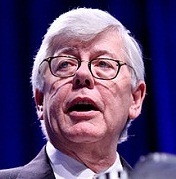 He earned a political science degree at the University of Wisconsin-Madison, where he made a reputation for himself as national president of the conservative Young Americans for Freedom. Following an unsuccessful bid for state Senate in 1969, Keene returned to UW-Madison to earn his law degree and then headed to Washington D.C. to join Vice President Spiro Agnew’s staff as a political aid. He went on to serve in various capacities for New York Sen. Jim Buckley, Presidents Ronald Reagan and George H.W. Bush and U.S. Sen. Bob Dole. As an attorney, political activist and columnist, Keene has written, spoken and lobbied on behalf of hunters, shooters and firearms owners for decades, and has been involved in nearly every congressional battle over gun rights since the early 1970s. “It’s really an honor for me to be with you tonight,” Keene told the large crowd gathered for the banquet. “I spoke here in 2010, before I assumed the presidency of the NRA. At the time, I was looking forward to a pretty easy and pleasant gig — to get to go around and meet a lot of people and hunters and outdoors people, give out some awards and just generally have a good time. Listening to what the Wisconservation Club is doing and has done over the years, he said, makes him realize just how important growing up in an area like Fort Atkinson is. He said that in looking at all the Wisconservation Club has been doing for decades, it is obvious that members are in a partnership involving conservation, preservation of wildlife, enforcement of laws that keep poachers and others from taking wildlife illegally, and protecting access not only to shooting ranges, but places where they hunt on public and private land. “The assault on those rights over the last few years has been significant,” Keene said. “When the last administration came into power, there was an attempt, for example, to pass a regulation that would have denied anyone under 18 years of age from possessing a firearm on any federal property. There were two things believed necessary during the “battle” with the Obama administration, he said. “The first — and the president said this in his speech — was to take down the NRA, because they knew that the root to restricting firearms rights required them to do that,” Keene explained. “I remember when the president gave his speech and a lot of us thought we were in real trouble. Not just the NRA, but that the Second Amendment was in real trouble. A key event that stopped that separation was the 2013 Eastern Sports & Outdoor Show, which was in its 61st year at the time and scheduled to take place Feb. 2-10, 2013. Organizers postponed it indefinitely after an announcement that there would be a ban on military-style assault rifles and high-volume ammunition magazines at the show caused multiple businesses and high-profile corporate sponsors — including Cabela’s, Smith & Wesson and the NRA — to withdraw from the show. “I remember talking to Tommy Millner of Cabela’s, and they’re based in Sydney, Neb. He said, ‘One of my assistants came in wringing his hands and said there was a protest out in Pennsylvania against the show and what were we going to do?’” Keene recalled. “Tommy said, ‘Pull the plug now.’ He said, ‘That was the easiest decision I ever made.’ And, within 32 hours, a show that benefited a bankrupt capitol of Pennsylvania to the tune of $70 million a year was history. What groups like the Wisconservation Club do with scholarships and supporting young shooters is the most important thing that can be done, he said. When Keene assumed presidency of the NRA, he recalled, he asked staffers how much of the money raised at NRA dinners from the state and federal levels goes toward youth programs. “It’s because of what you do now, what you’ve done in the past and what you’re going to do in the future, that these rights, that these sports … will be passed on and available to future generations,” Keene added. He said that a bullet was dodged in November, referring to the election of President Donald Trump. “We were on the verge of finding ourselves in a situation in which the Second Amendment could have been eviscerated or even basically eliminated as anything other than an artifact on parchment,” Keen said. “We avoided that, but the worst thing one can do is mistake winning a battle for winning a war. Following his speech, Keene was presented a Fort Atkinson Wisconservation Club Distinguished Service Award. The evening also included several other award presentations and many prize drawings.